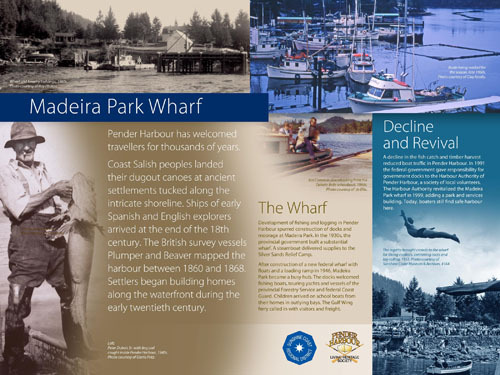 Pender Harbour's first heritage panel, titled "Madeira Park Wharf" was unveiled on August 12, 2013 before an enthusiastic audience. 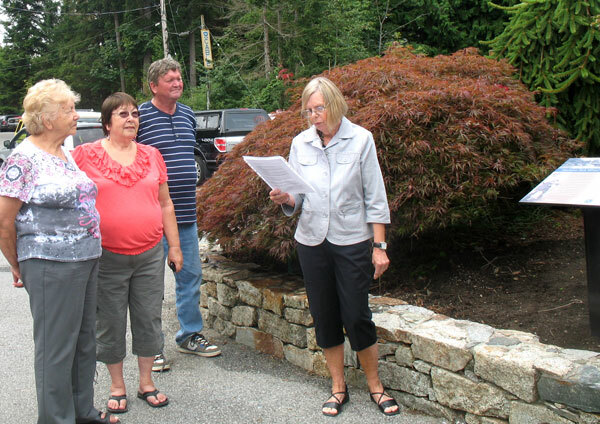 It highlights the history of the wharf and was funded by the SCRD. After introductory remarks by PHLHS President Elaine Park, Frank Mauro, SCRD Director for Area A, unveiled the heritage panel. PHLHS Vice President Dorothy Faulkner then introduced panel content. One of the panel photos is of fisherman Peter Dubois, and several of his relatives also attended the ceremony. Read the news in the Coast Reporter. Stay tuned for news on our future heritage panels! After introductory remarks by PHLHS President Elaine Park (right), Frank Mauro, SCRD Director for Area A (middle), unveiled the heritage panel and PHLHS Vice President Dorothy Faulkner (left) introduced the panel content. Fisherman Peter Dubois' photo is featured on the panel. Several of his relatives also attended the ceremony. L-R: Peter's daughters Gloria & Bonnie, and his great-nephew Len.